George William Pile Blake was born on 21 December 1915 in the small village of Ashley, of the Test Valley in rural Hampshire. The family later moved the few miles up the road to Stockbridge, a somewhat larger village dating back to the 12th Century and lying right on the River Test, about 9 miles West of Winchester. Son of a gamekeeper, in post-Depression Britain choices remained limited for young men like George Blake. For some years he worked in Liverpool, far from the green woods and meadows of his childhood. During this time, he first met Miss Zillah E Jones. In January 1939 George began working as a traveller (the sales rep or commercial traveller of today) with Thomas & Jones Ltd, a Merseyside firm of produce merchants or wholesale grocers to the bakery trade, based near Garston Docks. 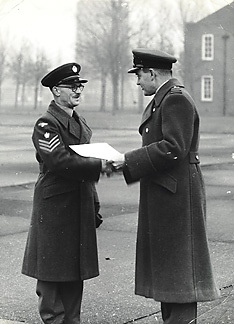 At the age of 24, with the gloom of impending war all too apparent, he changed direction, reporting to No 2 Depot RAF Cardington on 27 March 1939 to enlist in the regular RAF. Mustered initially in the Group V trade of Aircrafthand/Wireless Operator, 638733 Aircraftman 2nd Class Blake GW had signed on for six years service. In pre-war money, his starting pay would be just 2 shillings (10p) per diem, 14 shillings a week, or 36 pounds 8 shillings a year gross. At RAF Cardington, they kitted him out, then (ever the lot of the AC2 Aircrafthand on entry) drilled him thoroughly in the basics of Service life, all through that last Spring of peace. 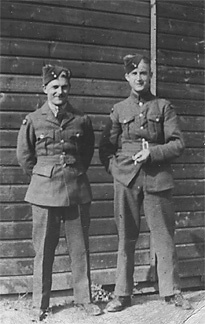 On the left, AC2 Blake wears the new-style RAF Service Dress, while his companion has kept his old style high-neck tunic of pre-1936 issue. Both wear the new Field Service or forage cap, and neither man shows any classification or badge. The two have the confident air of men who’ve already found their feet—indeed, by his uniform the man on the right may well be an Aircraftman First Class. The wooden hut is typical RAF Home Station fit. A sunny day some time before departure overseas, by the looks. The rapid expansion of manning and training tested the Service greatly in 1939 and 1940. In June 1939, AC2 Blake began his RAF trade training with 3 Wing of No 2 Electrical and Wireless School, which had not long been established at Yatesbury. However, it was October before the School received any aircraft for air training its Wireless Operators, and that may have contributed to a change of direction for George Blake. So near the end of September, with the Phoney War less than a month old, George remustered as ACH/Electrician Grade II. On 2 October he moved to Wales, where 9 Air Observer School, Penrhos had been formed just four weeks earlier. At least 9 AOS already had aircraft—about 10 Harrows, 10 Whitleys, a dozen Demons, and Wallaces and Battles in some number. However, his stay there was brief. By mid-October he was in Bedfordshire at one of the largest RAF permanent stations, RAF Henlow. There aircraft assembly work, operational Squadrons and a large training establishment all found a home, if in rather spartan conditions. Still, posted to No 2 Wing, one of the three devoted to differing technical training streams, he could now progress in his trade course-work. Apart from his VG character assessment as an under-training Electrician II, his record is tantalisingly sparse at this point. But at the end of February 1940 he was doing well enough to re-muster, to Trade Group II as Electrician Grade II, his pay rising accordingly to 4/6d per day (including war pay of 1s). With this advance came posting to an operational unit, No 149 (East India) Squadron. Based at Mildenhall in Suffolk and equipped with Vickers Wellington Mark I and Mark IA aircraft, they were about to send a detachment across to France. 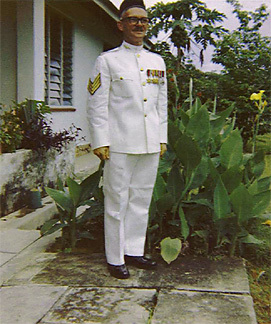 Ever the way of the Service, George’s posting was almost immediately followed by fresh orders and a week’s embarkation leave, beginning on 4 March. Not Mildenhall, then. Nor France in a chill Spring. By 11 March 1940, AC2 Blake was aboard ship, sailing via the still “safe” Mediterranean to Egypt and the sand, sun, and storms of the Western Desert. Arriving on Good Friday, 22 March 1940, he was one of a “draft of 44 airmen of various trades” posted in to No 211 (Bomber) Squadron, then at their tented war station at El Daba, near the coast 100-odd miles West of Alexandria. 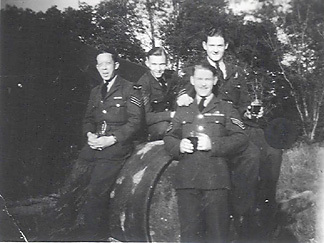 Training hard with their Blenheim Is, the Squadron’s authorised war establishment had been raised to 361 officers and men less than a week earlier. Old hands and new now had three days of “Easter Grant” to stand down, relax, and tidy up or settle in. The war must have seemed rather far away, for a time. Steve, Chicko Broadbent, and McCourt are named on the rear, apparently left to right. George himself is centre foreground, mug to face. A small contact print off probably 120 roll film, of aircraftmen on a break in a desert setting—time for a cuppa! The vehicle is camouflaged, the men in a mix of tropical khaki, one in shorts. The landscape has the look of the Western Desert around Daba (or Dab’a, or El Daba if you will) and Quotafiya, rather than the sandy wadis and rocky ridges of far-off Sudan. “Steve” is most probably 541488 Corporal Howard G Stephens, an Electrician I. Like George, Steve remained with the Squadron through the Greek and Syrian campaigns, on to The Sudan, then back to the re-forming Squadron in December 1941. He too made the voyage to the Dutch East Indies, fell captive in Java, and likewise somehow survived Haruku and all the other FEPoW horrors. The two stayed in touch post-war. George and Zillah married in 1946, and in 1948 Steve stood godfather to their daughter Monica. So too for 701873 LAC H “Chicko” Broadbent, LAC Armourer of 211 Squadron: on to 72 OTU; then back to the Squadron for the Far East move to Sumatra and Java in January 1942. Chicko, though, was one of the lucky few 211s to reach the port of Tjilatjap on the South coast of Java in time to be ordered aboard the Tung Song on 2 March. Sailing just before the fall of the Dutch East Indies, they reached Fremantle safely on 13 March. Of McCourt, no further record is to hand at present. On the afternoon of 10 June, the Italians declared war with effect from one minute past midnight. The Squadron was ready, flying a photo reconnaissance near dawn on the 11th, and mounting raids on each of the following three days, the pace hot. Although near the local village, the rail line, the coast road (and Heliopolis less than an hour and a half away by air), in their tents and temporary shacks the general conditions at Daba could still be testing, hostilities or no. Occasionally there were small outbreaks of sand-fly fever and other ills of desert life. Perhaps it was that, or some work injury, that had Blake admitted to 2/5 Casualty Clearing Station Daba on 19 June during a brief quieter period. By 22 June he was back on duty. Shortly came the welcome step up to Aircraftman First Class, with effect from 1 July, and an extra 9d a day in the paybook. 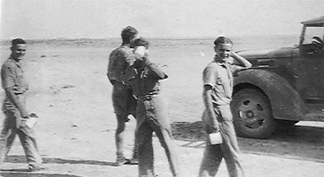 In the Western Desert, the work of the Squadron groundcrews in support of their aircrews continued, while the Italians slowly built up for an advance to Alexandria and Cairo that in Mussolini’s mind was simply a matter of course. In the event, Graziani’s force was not all that well prepared. In early September, with the Battle of Britain at its height, the Italians finally launched their Desert assault with air attacks, artillery barrages and forward movement of armour and infantry. By mid-September Graziani’s force had advanced some 60 miles along the coast road from the Libyan frontier. Then, just beyond Sidi Barrani, with an abundance of caution they halted and dug in. In Europe it was now early Autumn. Great Britain had not succumbed to the blows of the Luftwaffe nor yet to the belated token contribution of the Regia Aeronautica. Mussolini, meanwhile, had been nursing other plans to bolster his strategic position in and around Mare Nostrum. On 28 October, after an amount of provocative posturing, the Italian Minister in Athens presented the Greek Government with a set of demands that were in effect an ultimatum, briskly rejected by General Metaxas. Soon Italian forces based in Albania were across the North Western border of Greece and moving South into Epirus. With no further attack on Egypt apparently imminent, the British Government promptly determined upon assisting the Greeks, initially by air support from RAF Middle East. Within days, 211 Squadron was on the move, to Ismailia, to Alexandria and thence to Greece by sea and air. One of a small number of RAF units that could be spared, by 25 November, the Squadron was re-established and operational at Menidi (Tatoi) on the Northern outskirts of Athens. With them was Leading Aircraftman George Blake, this next step up having come on 1 October. In the Desert, they had battled with the electrics against dust and sand. In Greece, it was against ice and snow, enough to give gunners frostbite or freeze aircraft cameras and other electrical kit. In his annual assessment, Blake’s steady service as an Electrician II drew some recognition, recorded in laconic RAF abbreviations as VG in Character and with it, the notation for Superior under trade Proficiency. Post-war, both these marks of recognition would continue to accumulate, rising to the highest possible rating, Exceptional. For nearly five months the Squadron had done well against the Italians in Albania, though not without loss. Then came the grievous casualties of Easter Sunday 1941. Withdrawn from Paramythia to Athens, then via Crete to Egypt on the fall of Greece, they redeployed to Palestine for the brief and bitter Syrian tussle with the Vichy French. In early June, after a year of hard fighting and rapid movement, they were stood down from operations, bound for The Sudan to set up a twin-engine bomber Operational Training Unit at Wadi Gazouza in the Red Sea Hills. With Mark I and Mark IV Blenheims to look after a pretty long way from anywhere, in early July George scored so well in his Trade Group I examination for Electrician Grade I that he was accorded the rare Exceptional rating and promptly remustered at that level: LAC GWP Blake, Electrician I, was now due 6/6d per day including war pay. In late October, No 72 OTU formally “stood up” at Wadi Gazouza, absorbing the old 211 hands as it did so. Even if the non-operational rest period had not been due to end, events in the Pacific now overtook whatever plans had been made for the Squadron’s re-forming. Plucked rudely out of 72 OTU on 20 December, by early January 1942 they were back at Helwan. On New Year’s Day, George Blake was promoted Corporal (Temporary - the way of the war-time RAF), paid at the rate of 8/9d a day. Gathering a complement of 24 Blenheim Mark IVs and making up their establishment of air and groundcrew to match, the Squadron was now destined for the war against Japan, and all that desperate first Far East venture. The privations faced by those made captive by the Japanese at the fall of Singapore, Sumatra and Java were dire indeed, as recounted elsewhere here. It was not until the mid-1970s that George Blake began to speak of his PoW experiences to close family. The narrative which follows is Monica’s, summarised from her father’s recall, her own searching, and some small input from me. Later additions of mine are marked [in the usual way]. “In January 1942 he left Port Tewfik in Egypt on the Yoma and arrived in Oosthaven, Sumatra, in mid-February. From there he went to Batavia (now Jakarta), where he worked on the docks, and then to Purwakarto and Tjilatjap. Following the fall of Singapore, and the subsequent capitulation of the Dutch on 8 March, he went to Tasikmalaya, where he was taken prisoner. Later that month he was taken to Malang in East Java to repair an airfield. Four prisoners were shot trying to escape—an incident recounted by Home. He then went to Surabaya, where he remained for six months. In Easter 1943 he left for the island of Haruku. There he worked on the creation of an airfield from two hilltops. Home describes this period as being the worst for the POWs. Of 1,000 POWs on Haruku, only 400 returned. Some six months later he returned to Surabaya. He then went to Hospital Vincenches in Batavia, where he stayed until May 1944—first as a patient then as a batman. Next he was in the Cycle Camp in Batavia, where the commander was the war criminal Soni. Here he worked for six weeks in the bakery. Compared with other tasks the POWs had to endure, bakery work was relatively good. A Japanese guard instructed that lots of yeast be put in the bread in relation to the flour. The bread looked fine when it left the bakery, but later sank. The guard sold the flour at a local market and bought carrots and onions to cook in the bakery ovens. During this period, George was present at an incident on the way back from the bakery to the camp. A Dutch woman cycled past and threw a letter among the prisoners. A Japanese guard spotted this and began beating her. Then three Germans came by. They attacked the guard and wounded him seriously. The prisoners were told to remove a door from a local shop and carry the guard back. That night the prisoners were questioned about the incident until 2.00am. Then they were told the guard had died. They had to get up again at 5.00am. On 9 September 1944 George set sail on the Junyo Maru, one of the vessels described as Hell Ships because of the appalling conditions on board. He said they were told they were going to Japan, although it seems the intended destination was actually Padang. On 18 September the ship was torpedoed off the western coast of Sumatra by the British submarine HMS Tradewind. As the ship began to sink, many of the panicking passengers ran to the end out of the water. However, George noticed that the gap between the deck and the sea was widening at an alarming rate. He realised that the longer he remained there the further he’d have to jump. He plunged into the water. There had been 6,500 POWs on the ship; only 880 survived. The ship had neglected to carry the Red Cross that would have indicated POWs were on board. For many hours he was on a raft with several Dutchmen. Unlike some of the others, he resisted the temptation to drink seawater. Eventually he was picked up by a Japanese naval ship and taken to Padang. From there he went to Pakanbaru in eastern Sumatra and was set to work building a railway to Palembang. Liberation came at the end of August 1945. Shortly after the atomic bombs had been dropped on Hiroshima and Nagasaki, the guards left the camp. British planes flew over and dropped supplies. George obtained a towel, which he traded with a local fisherman for five baby sharks. The prisoners were visited by Lady Mountbatten, accompanied by an Australian Brigadier. Lady Mountbatten asked if there were any “Hampshire lads” among the men. George and four others were duly introduced to her. She told them they’d all be out soon—the sick the following day, the others soon after. That night George went down with malaria, and the next day he was flown from Sumatra to Singapore hospital. Summary compiled by Monica from conversations with her late father]. “17 January 1942 Left Port Tewfik, Egypt, on the Yoma. 19 February Arrived Batavia. Worked on docks until 3.3.42. 3 March 1942 Left for Surabaya. Got as far as Purwakarto (c. 8.3.42). 9 March 1942 Dutch capitulated. With Tommy* to Tjilatjap and back. c. 10 March to 12.March 1942 Then to Tasikmalaya, where taken prisoner. c. 20 March to 22 March 1942 To Malang, E Java, to repair airfield. Four shot trying to escape. Easter 1943 Left for Haruku. Made airfield from two hilltops. Of 1,000 men, 400 came out. 6 mths later Back to Surabaya (took 1 mth by ship). Hospital Vincenches, Batavia. Stayed until May 44. May 1944 Cycle Camp in Batavia with Soni (war criminal) in charge [Captain Soni, otherwise “Sonny Boy”]. Worked 6 wks in Japanese bakery. September 1944 Sailed for "Japan" [Junyo Maru]. 18 September 1944 Sunk [HMS Tradewind]. 21 September 1944 Arrived Padang after being picked up by Japanese naval ship. 1 month later Went to E. Sumatra (at Pakanbaru). Started railway to Palembang—now known as trans Sumatra railway. End August 1945 Liberation. Flown to Singapore hospital. [Thomas William Thomas 631343 survived captivity on Java, at Haruku and at Singapore]. Untrammelled by the niceties of either the Geneva Convention or the Hague Convention, the Japanese made free use of FEPoWs and impressed natives as forced labour. These men were transported in large numbers in appalling conditions, usually in unmarked cargo vessels, as far as Japan. As the balance of war swung to the Allies from 1943 onwards, Japanese shipping came under increasingly heavy attack by submarine. Among the losses were 11 ships carrying prisoners, of whom nearly 18,000 died. In September 1944 the Junyo Maru was transporting forced labour from Java to Padang in Sumatra. She was sunk on 18 September by HM Submarine Tradewind, near Moeko Moeko, Sumatra. Aboard ship were 2,200 FEPoWs of mainly Dutch and UK origin, together with 4,200 Javanese forced labourers (most of whom perished). Of the FEPoWs, there were 723 survivors (47 of them RAF), leaving 1477 missing (64 RAF). ”George attributed his survival to the good food of his childhood. Although there was little money in the household, there was always enough to eat. When times were hard, his father, a gamekeeper, would shoot rabbits. George also noted that he was rather older (late twenties) than many of the men he saw dying around him. He thought this gave him an advantage. After his horrendous experience, he never took life for granted; he was thankful to be alive. Back in England, George began to recover from the illnesses he was suffering from and in January 1946 married Zillah Jones, the woman who’d waited for him and with whom he’d corresponded on the rare occasions prisoners were allowed to send postcards. The wedding photo shows him looking bloated, apparently a side effect of beriberi. During the honeymoon, he was ill for two days with a bout of malaria. “After service with the “V” force at Wittering near Peterborough, he was posted to Winterbourne Gunner to the Defence NBC School. Leaving the RAF in 1971, he and Zillah bought a bungalow in the village of Porton and for several years he worked at what was then known as the Chemical Defence Establishment at Porton Down. In the course of exchanging emails and yarns with Monty Walters, it turned out that his cousin George Blake had also served with No 211 Squadron RAF. Monty and George had met briefly after the war at RAF Middleton St. George. They lost touch, but 50 years later and at opposite sides of the globe, were once again exchanging family news and Service tales until about the time of George’s death in 2002. Monty put me in touch with George’s daughter Monica. Over the next couple of years, Monty, Monica and I struck up a friendly and fruitful correspondence. Over the course of our exchanges, Monica kindly passed on a comprehensive set of material about her late father’s RAF service. It is thanks to her generosity that it’s been possible to compile this account, from George Blake’s extensive RAF Form 543A Record of Service and from Monica’s own summary of his Far East service and arduous captivity at the hands of the Japanese. Back in Liverpool, where George had worked up his order book on chilly journeyings as a sales rep in the last Winter before the War, the firm of Thomas and Jones Ltd still goes about its business, having moved all of 10 miles in the decades since 1939, across the Mersey from Garston Docks to Birkenhead. In Hampshire, the ancient hamlet of Ashley and the remnants of its Norman castle still lie on the chalk ridge below Ashley Wood and the old Roman settlement site, the green meadows of the River Test two miles away. British History Online: Hampshire 040—Ordnance Survey 1:10,560 Epoch 1 (1879) and Ordnance Survey (2010).